I love the sleek silver design of this compact! Verdict: This box has a retail value of $65. I’m very happy with that, and this is actually on the low-end of what Le Metier de Beaute usually sends! What do you think of the April Beauty Vault VIP box? Has anybody received a May or June box or an email about the delay yet? Nope! Also, they still have not opened up sign-ups for renewal yet (it still says May but when I emailed them they said they had not opened it up yet). I just checked the website. What is going on I wonder? I set my iphone for 5/1/18 and got on the site first thing. It said sold out. I emailed several times before I got a response telling me the VIP boxes had not yet gone on sale. I got no response to my question asking when they woud go on sale. I just looked at the site and every single item is sold out. I have also noticed that they have no shows scheduled for QVC. I am wondering if they are going out of business or something. Please post if anyone finds out new information. I did not see anywhere on the site where it lists the new signup day as 8/1/18. Where was that located? This sub is now open for enrollment, as of May 1st. They say on their site that the August shipment will be the first. That seems weird since on the main VIP screen it says that enrollment begins May 1. Oh well… I guess it wasn’t meant to be for me this year. So now it’s saying that VIP sign up starts Aug. 1, 2018, with the first shipment in Sept. 21018. What about our May and June 2018 shipment, guys?? My thoughts as well….they could at least send an email acknowledging the delay. I am a current subscriber, with a couple questions. Did the company contact you to re-subscribe for the coming year?? I have not heard peep from them. I thought they usually offered a discount to re-subscribe? Also…has anyone received their May shipment yet? I’m wondering the same things! I’ve contacted them to ask through Facebook and have heard nothing back. Their website said the subscription for next year would be available on May 1st. Also we usually get the current month’s item(s) by now. I ‘ve discover many wonderful products with this sub and I think their price is amazing. However, they are irregular with their shipments and you have to harras their customer service if you are missing a shipment or an item of your shipment. I put up with them because, in my opinion, the price/value is amazing. Our deepest apologies. The May VIP package has not shipped yet. Great 😩. Exactly when SHOULD I expect it????!!!! Got the same exact reply today. I replied and asked if they had any estimate on when they would be shipping. They also completely ignored my question about when the 2018 signups would happen. Subscription is renewal is August so we should get a may, June n July box!! Here are the responses I got from customer service, i have no idea what this means, it’s already June and, according to the website, the 2018-2019 program is sold out. We have not begun sign up yet for the 2018 VIP program. Sorry for the confusion. I had this sub for a few years. This year I didn’t renew. I got tired of receiving second quality items from them. It takes a while to catch on, but I wasn’t alone. Lipstick tubes that rattled, discontinued nail polish, old eyeshadows with new labels (when I depoted the pans, it had a different label on the pan from the packaging), $350 face cream that felt and smelled like menthol foot cream (gave to my housekeeper), and others. They do state on their site that you may receive products that are not released (still testing). I always felt like it was blooper batches or discontinued items. Even the shipping deteriorated from a luxe black box, ribbon, and another brown box, to a bubble envelope like Ipsy with a return address that appeared to be someone’s home. But if it works for you and brings you joy, that’s what matters! Just don’t be fooled by the theoretical price tag. Not judging, just asking — you gave suspicious face cream that smelled like menthol to your housekeeper??? This is the only sub I have at the moment. I’ve had it for 3 or 4 yeara and I’m very happy with the overall contents. My makeup lasts all day without the need of primer. I love the makeup from this people since I’m always on the run and I can always achieve a flawleess look in no time! It took a collaboration with some blogger to produce this item? Come on. Is she a consumer products chemist? Didn’t think so. Why would they be? Influencers help with shade or product selection and sometimes give feedback on test versions but don’t produce the actual product. Temptalia once did a collab with MAC and wrote a great piece on the process! Bloggers and collaborations with them are en vogue. It’s as simple as that. I miss the signups every year it seems. 🙁 Even if a month is a miss, like this one for me it is a MAJOR win overall. So far there are 2 months that I would not use myself over the last couple years. So $348 upfront once a year with a ultra hi end company that is rock solid (no chance of the sub running off with your money) and it works out to $29 a month. 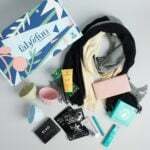 You can get Glossybox for $21, sure it’s cheaper but out of 5 items how many are a true hit for you? That swap or re-sale on ebay for even anything close to the “RV”? They almost always send a palette that is worth $95 at least once and the skincare is decadent!! A REAL brand, not some made up fake luxe one. LOL If you pop over to ebay these items go for a pretty good chunk of their (still inflated) RV. Generally no FOMO for this sub, but those colors are *beautiful*! This subscription baffles me. One item. What if I have no use for it? No, thank you. I don’t really understand what baffles you. This is a luxury subscription and it’s products are very expensive and well received and known. Last month they sent a $350 serum as the one item. I would have loved to sample that for $29/month!! Please read my comment before submitting your “answer”. Did I question the value, price or fame of the brand and its products? No. (At the risk of getting snapped at like the other commenter…) I said the same thing as you did about this sub. It’s definitely quality over quantity – which can be pretty awesome – and they truly seem to be excellent products, but I’d be a bit ticked off if I received items I couldn’t use (like this one). It’s a great sub, just not for me. Thank you, Lizzie, for taking time to understand what I wrote. I have previously seen (sadly) people leaving rude comments about a person’s opinion on a product. I felt for you when I saw that response. You’re allowed to express how you feel about a ‘thing’ without having someone be mean to you, a person not a ‘thing.’ It’s the risk of posting, unfortunately 😕. Try not to let it upset you too much 🙂. You stated your opinion in a much nicer way than the original commenter did. I understand why she was “snapped” at because her tone was bad and insulting to the company and the people who love the sub. Your comment said the sub was good but not for you, which is perfectly valid and not insulting anyone, so I doubt you will get snapped at. Emilia, I am with you. This product can be as lux as it can be, and expensive as it can be, but I just dont get it. Looking at the past boxes, only one month that was truly wow – serum. Usually, it is mostly make up. When it comes to make up, we usually pay for the name. I tried Charlotte Tilbury make up, and honestly, did not see a difference when I use make up from Boxycharm. I looked up past boxes also and came to the same conclusion Svetlana did-The box with the serum was the only “wow” box. Emilia, I also agree with everything you have said even down to the Avon lipstick,I have tried quite a few very expensive ones and Avon lasted longer and did not dry my lips out. Same with mascara,I have tried $40 mascara and like my $7 brand just as much if not more. A name is sometimes just a name.